ABC Halton organizes events through the year for its members. The events are a mix of casual, social nights and informative sessions with expert speakers. There should be something to appeal not only to long-time ABC members, but also to parents of very young gifted children and parents of newly identified students. Don't miss out! Check this page, and Like us on Facebook to get updates on events. ​To connect with other parents, please join our Facebook Parents Chat Group! Further details and registration info will be posted in mid-August. How emotional stresses can end up in emotional dysregulation and become fears, phobias, anxieties, meltdowns and defiant acting out behaviours. How to track anxiety -type symptoms early before they become predominant in a child’s coping experiences. How to then intervene and support a gifted child's major socio-emotional, intellectual, cognitive and physical needs during stressful episodes and transitions. What is most helpful for gifted children during a particular developmental phase, or situation such as underachievement, depressive, sad or angry episodes or fears and anxiety outbursts. How to assist a gifted child's potential with encouragement, support and maintain their positive growth and maturation. Everyone is welcome. Admission is free. Donations will be gratefully accepted. Leon will be sharing his experiences with the broader community and what he learned from filming his show, in which he circumnavigated the globe on his vintage yellow motorbike 'Kindness One', giving life changing gifts along the way to unsuspecting good Samaritans. All of this whilst relying on the kindness of strangers. River Oaks PS invited the U.K. native to Oakville to share his message that anything one can dream of is possible and that the fuel for this potential is simple: Kindness and harnessing the power of human connection. All are welcome as this event is open to the public, so please share our free ticket link widely. We hope to show Leon how his vision has inspired a community so far from his own. Secure your seat by reserving tickets today! Eric Windhorst, a PhD Student in the Faculty of Applied Health Sciences at Brock University (located in St. Catharines, Ontario, Canada), has contacted ABC Ontario asking us to tell our contacts about a study he is conducting. The purpose of Eric’s study is to better understand gifted adults’ connection with nature and how this connection relates to mental health and environmental behaviour. Eric is inviting you to participate in the study. Contributing to the study will involve participating in two, one-on-one interviews with Eric that will explore your connection with nature. Each of the two interviews will be approximately one hour in length. Interviews can be conducted in-person or via Skype (whichever is preferable to you). To participate in this study, you must be over the age of 25 and self-identify as gifted. It is expected that the risks associated with participating in this study are minimal. Eric has explained that you can withdraw from the study at any time. Our organization will not be notified who did or did not participate in the study. 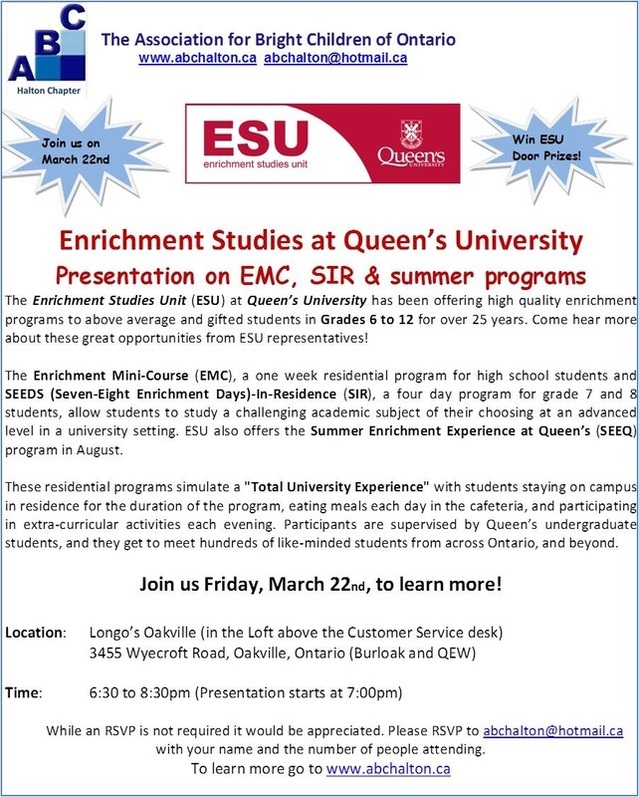 If you are interested in participating in this study or getting more information about it, contact Eric directly via email: ew14ft@brocku.ca. Location: Lowville Park, Picnic area # 3, Guelph Line, six miles north of Dundas St. (Hwy #5) in North Burlington. All proceeds will go towards future ABC Halton Chapter events. Ashlee Baldwin, a Child and Youth Counsellor from the HDSB Woodview Autism and Mental Health Services center, came to talk about anxiety and coping strategies for kids and families. Thank you Ashlee! Special thanks to Linda Delean as our guest speaker with a brief presentation about fostering creative thinking skills. Guelph Line, six miles north of Dundas St. (Hwy #5) in North Burlington. Is your child in the HDSB or HDCSB self-contained gifted class? Will your child enter the program in September 2015? Thank you all for joining the parent information session with our guest speaker Natalie Orenchuk-Tomiuk. Assessment, Consultation and Treatment -Gifted Complexities in Children, Teens, Adults, Families and Couples . Gifted individuals carry specific cognitive ,academic, socio-emotional and physical characteristics and intensities. Significant, crucial supports and accommodations are necessary for Gifted individuals in childhood in order to provide resilience, contentment ,the continual emergence of their gifts and prevent negative patterns or choices . Natalie’s specialization involves dealing with gifted complexities, talents and skills which are frequently undernourished hidden, underutilized or misunderstood in gifted children and adult gifted. Gifted individuals are at high risk of dysfunctional habits or choices that prevent their progress and eventually anger, depression and sadness emerges as a regular component of their lives. Studies indicate these patterns may become ingrained in neurological centres in the brain . Once these patterns are reinforced over long time periods better self management strategies are greatly hampered . Natalie has have found specific approaches can build on strengths and prevent these patterns and ways of functioning from emerging and also to reverse current negative patterns in children and adults. Full range of Gifted and Gifted dual diagnosis issues addressed such as Depression, Anxiety, ADD/Adhd, School /Sport Performance Issues , Parenting Conflicts , Marriage Difficulties, Fears, Learning Disabilities ,Aspergers, Autism, career transitions and retirement planning and many other Life issues. Is your child in the HDSB or HDCSB self-contained gifted class? Will your child enter the program in September 2014? Free admission!! Donations are welcome. Baked goods and drinks will be available for purchase. All proceeds will go towards ABC Halton Chapter events. Calling all the volunteers out there to help ABC Ontario Halton Chapter. 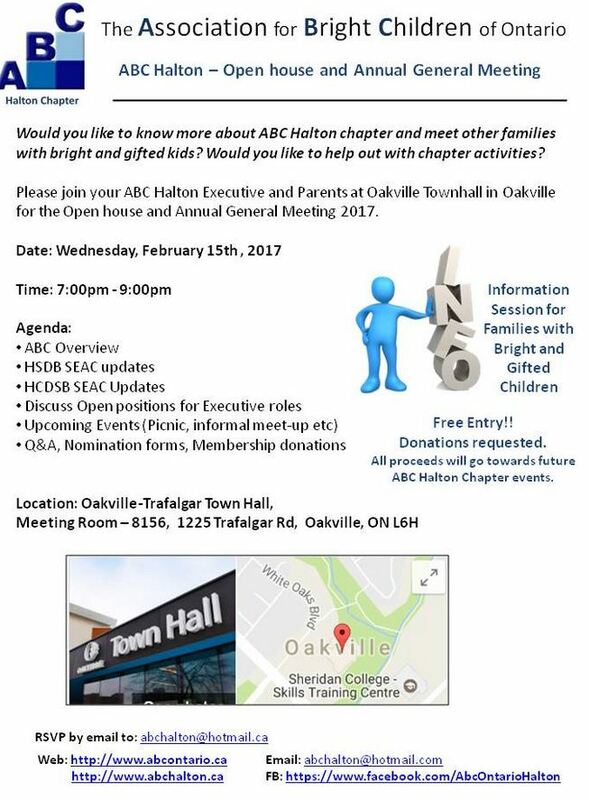 ABC Halton Chapter is looking for volunteers to fill in various positions and meet face-to-face to plan for the upcoming events. We'd like to meet with you but if you are not able to join please send an email at ABCHalton Volunteer and advise on the group you are interested in. ABC Halton Chapter is proud to invite you to a High School Students led experience sharing session in Milton. After the presentation there will be time to ask questions and network with other families. CONFUSED about gifted education options in Halton? Need more information to make informed decisions? Need an opportunity to speak with other parents who have “been there”? Join ABC Halton for an information sharing evening where you can find answers to your questions. Kids are also invited to meet their friends over some delicious desserts provided by the host!! ·Gifted individuals are at high risk of dysfunctional habits or choices that prevent their progress and eventually anger, depression and sadness emerges as a regular component of their lives. Is your child in the HDSB/HCDSB self-contained gifted class? Will your child start in the new program in September 2013? Wish to attend?? Register Here!!! • let the kids meet new friends . • learn more about the program from the parents with experience. • find out more about your ABC Halton chapter and events. Bring your own Nut-free Picnic Basket. • Bring your own hibachi or portable barbecue. • Alcoholic beverages are not permitted in the park. • No on-site electrical service available. on Guelph Line, six miles north of Dundas St. (Hwy #5) in North Burlington. 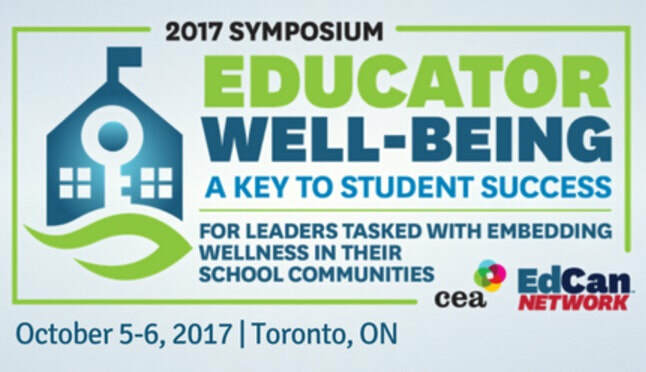 Time: 8:45 - 9:30 a.m.
Time: session 1 – 9:00 a.m.
session 2 – 11:10 a.m.
After the presentation there will be time to ask questions and network with other like-minded parents. This event is free, but donations are always appreciated. Feel free to bring your kids along to listen to the high school experience. North and South Halton January Parent Chill Sessions Combined. ABC Halton Chapter is proud to invite you to a presentation by Michael Topa. After the presentation there will be time to ask Michael questions and network with other like-minded parents. PLEASE NOTE: This event is free, but donations are always welcome and appreciated. Michael Topa was born in Michigan, and grew up there and in Texas and Afghanistan. He was educated at the University of Michigan, University of Guam, York University and the University of Toronto. He has an M.A. 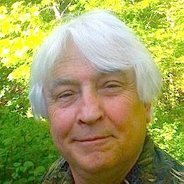 degree in School Psychology and has worked as a Psychoeducational Consultant in school board and private practice settings for over 35 years. In that time Michael has carried out approximately 3500 psychological assessments with "children" from 4 to 54. He has a particular interest in giftedness, in identifying children's learning styles, and educational planning with adolescents and young adults who present with unique learning characteristics. In his spare time, Michael enjoys collecting antiques, writing poetry and playing with his two dogs - Tanner, a Bordie Collie and Eddie, a Cavalier King Charles Spaniel. PLEASE NOTE: This is a PARENTS ONLY event.